Machine had been moved to the Annie McLeod Museum hallway just after the ticket desk but now it's gone and after checking all previous places this machine was situated i contacted the manager to be told it is now retired. S Shand. <p> One 1-die Eurolink machine. 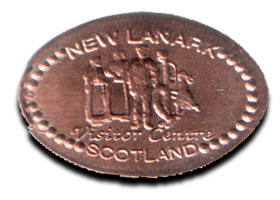 Design was: <br> 1) New Lanark Visitor Centre, Scotland', people. Machine had been moved to the Annie McLeod Museum hallway just after the ticket desk but now it's gone and after checking all previous places this machine was situated i contacted the manager to be told it is now retired. S Shand. 1) New Lanark Visitor Centre, Scotland', people.